"What does it make me ask about me?" the governor of New Jersey said about halfway through his press conference today, paraphrasing a reporter's inquiry, and even though the event continued long afterward, this question seemed to contain its essence, and in some way the essence of Chris Christie too. In his news conference on Thursday [Chris Christie] found a way to spell apology with a thousand I’s. Gov. Chris Christie’s lengthy press conference on Thursday had many echoes of previous political moments of regret. Herewith, strung together, apologies culled from notable speeches and statements made in the aftermath of wrongdoing or other officeholder embarrassments. From this we can conclude two things: First, that political apologies are indeed more self-referential than the general run of political press conferences; and second, that George F. Will is singularly uninsightful and also … well, something else. It's normal for George Will to state falsehoods as if they were obviously true — but he seem oddly committed to this particular false claim about Obama's pronoun usage. 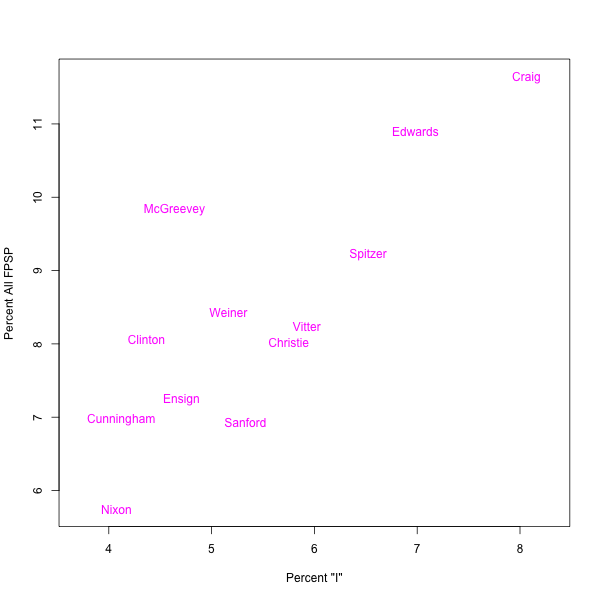 And as you can see from the data presented above, Christie's recent redemption plea was not unusually self-referential either, compared to other American politicians' performances in similar circumstances. Please keep in mind that in addition to being generally unwilling to support their prejudices with an actual comparisons of rates, our punditocracy has a poor understanding of what rates of first-person-singular-pronoun usage might actually mean. For a discussion, see "What is 'I' saying? ", 8/9/2009. My goal here is to discourage facile op-ed columns of the form "I find X annoying and will therefore accuse him/her of talking about himself/herself too much, dressing this up in unsupported claims about rates of pronoun usage". 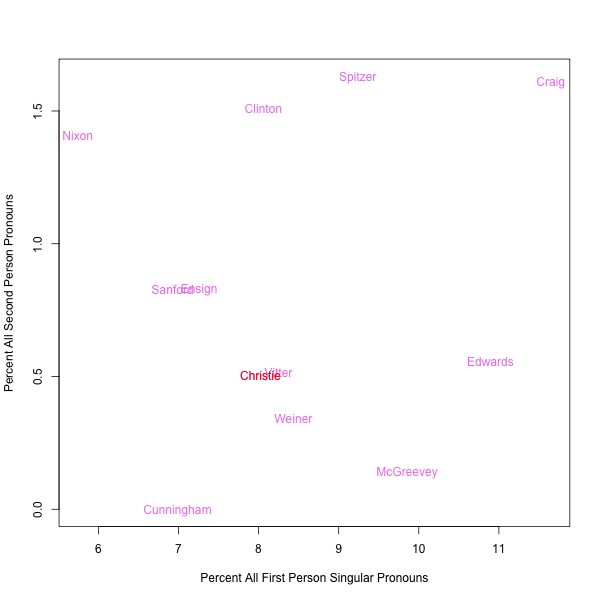 Careful empirical work on pronoun usage might well tell us something about the character of public figures (or of their speechwriters). But careful empirical work is not something that we can expect from most popular columnists, especially when the subject is language. 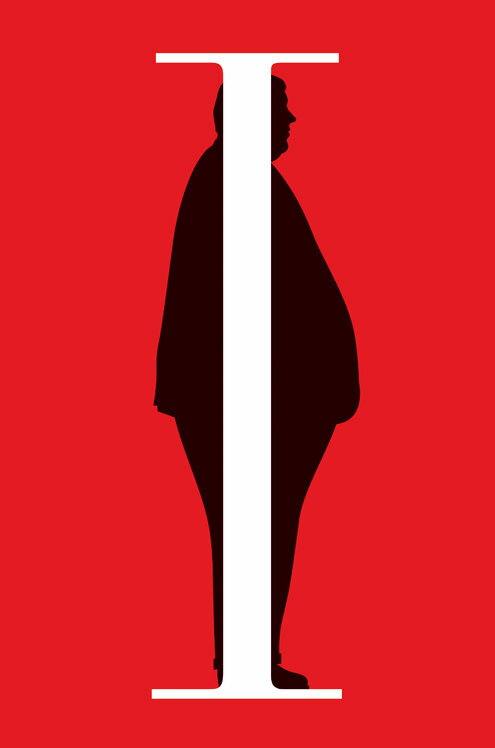 Update — for some additional pundidiocy on this topic, see Dana Milbank, "New Jersey Narcissist", WaPo 1/10/2014; Noah Rothman, "Washington Post Opinion Writers Discover Narcissism… In Republicans", Mediaite 1/10/2014. From Prof. Liberman's data, percentage of FPSP is in reasonably good proportionality to the percentage of "I" with coefficient 1.5. Google Ngram shows that in 1880-2010 this ratio was stable with (slow) variation between ~ 1.45 and 1.65. Counting first-person pronouns like this as a way of analyzing politicians' alleged egotism ought to be discouraged. A politician can say "I deserve all the credit" or "I deserve all the blame," and both of those statements are 20% first-person pronouns, but they reflect very different portrayals by the speaker of himself or herself. [(myl) You need to address this complaint to George Will, Stanley Fish, Charles Krauthammer, Peggy Noonan, etc. James Pennybaker's post "What is 'I' saying, linked above, observes that the rate of first-person pronoun usage responds to several quite distinct dimensions of motivation and content, beyond the typical pundit's simplicistic "I = narcissism". Indeed, do we want people apologizing by blaming someone else? It is not surprising, whatever the degree of cynicism or egotism of the speaker, that a press conference whose purpose is an apology should contain more "I"s than one devoted to say, the economy. A high percentage of FPPs and third-person pronouns in an apology might suggest that the person is not taking appropriate personal responsibility. Conversely, I would think that a high percentage of FPSs would be a desirable feature of "redemption pleas" and would not be a sign of egotism. My guess is that conservative pundits find Obama's FPSPs particularly jarring. 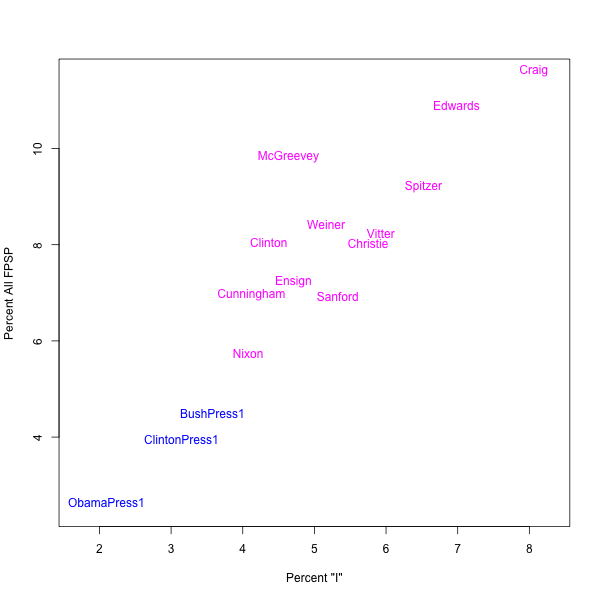 There may be an analytical observation to be made here, but it's not about Obama. If I understand MattF correctly, his claim is that when pundits foolishly call white politicians narcissists because they supposedly use too many first-person pronouns, the pundits are ignorant. When they foolishly call President Obama a narcissist because he supposedly uses too many first-person pronouns, the pundits are racists. Is this just because "conservative pundits" are known to be racists, or is there some evidence so well known as not to be worth mentioning? Or is a "guess" reason enough to accuse people of racism? [(myl) The situation is not nearly as symmetrical as you suggest. Sarah Palin was once accused, inaccurately, of overusing the first person singular; and ditto for Chris Christie in the case of his convention speech, where the fact that he did talk about his own administration rather than the national ticket for most of the speech was a relevant incitement. I commented on of those cases when they happened. 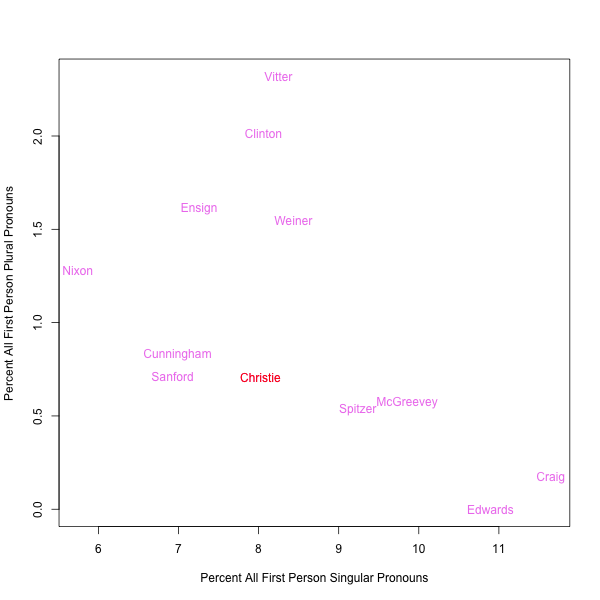 In contrast, Barack Obama has been accused many dozens of times, by many commentators at all levels, of over-use of first person pronouns in many presentations, although in fact the relevant rates are significantly lower than those of other presidents in comparable circumstances. @Alan Gunn: How about this: I'll allow that my guess was one-sided– in fact, I'll admit that I find verbal tics in speeches from conservative politicians jarring, although liberal politicians may show the same tics. Does that clarify what I'm saying? Re: myl subcomment to Alan Gunn. A liberal parallel would be an attempt to prove George W. Bush's stupidity by pointing out his occasional speech errors, which you debunked over the years. Clearly, the motivating factor there was pure spite. It very well may be the same thing from the other side. @MattF: Well, if your position is that conservatives notice dopey or annoying things liberal politicians say and liberals notice dopey or annoying things conservative politicians say, I agree. There's a study showing that Republicans think the president has a lot of control over gasoline prices when the president is a Democrat, and that Democrats think the president has that power when the president is a Republican. It's the suggestion that the narcissism charge against Obama is racist that bothers me. If that wasn't what you meant, I apologize. @MYL:Lots of people think narcissists use first person pronouns excessively, so it's understandable, though unfortunate, that people then jump to the conclusion that politicians they don't like, and perhaps especially politicians they think are narcissists, use a lot of those pronouns. I think the president gets more of this than some others for a couple of reasons. First, he's the president, not an ex-governor of a small (in population) state or the governor of a state many people make jokes about. You may recall that the last time this issue came up people gave many examples of the excessive-first-person-pronoun charge involving past presidents. Second, before becoming president, Obama wrote and published his autobiography twice and, so far as I know, never wrote anything else except a student note when he was in law school. That could encourage even unbiased people to suspect him of having a large ego, even by politician standards. It's likely that people who dislike the president for various reasons will jump on this. Some of those people are probably racists. But to pick that as the likely reason without further evidence seems unfair. I've been reading Krauthammer (whom I like) and sometimes Will (whom I don't much care for) for a long time, and I have never seen any evidence of racial bias in the work of either of them. Mr. McIntyre's having grown up hearing racist remarks doesn't give his views any particular authority. Furthermore, if I remember correctly, his first post on this matter did not include that bit about not lightly accusing people of having racist attitudes. It struck me at the time as being very much a knee-jerk reaction. And when I complained that accusing people of racism without evidence was unfair, Mr. McIntyre described my comment as "vitriol." "There's a study showing that Republicans think the president has a lot of control over gasoline prices when the president is a Democrat, and that Democrats think the president has that power when the president is a Republican." Would you happen to have a citation for the study? It sounds like a valuable contribution to the study of the third-person effect. I do not know John McIntyre and do not know his written work well enough to have an informed opinion as to whether he is or is not prone to knee-jerk reactions (or at least more or less prone than the average person, since presumably none of us are entirely free from the tendency). But the particular passage quoted from him certainly seems, in isolation ( and this was my reaction at the time), very consistent with what one might expect as a knee-jerk reaction from someone of his approximate generation, background, professional path, etc. Which is not to say that he, as an individual, should be reduced to a statistical/sociological generalization, only that I have no personal basis to give his views on the matter any particularly great weight. A perhaps more immediately relevant line of stereotype-inquiry here might be whether Gov. Christie's prior public persona as filtered to us through the media (which perhaps might be characterized as "brash" or "in-your-face," not necessarily narcissistic but also neither reticent nor self-effacing) is affected by widely held stereotypes about what people from New Jersey tend to be like, and indeed whether the governor and/or his handlers encouraged that perception, which may perhaps now mean he needs to take the bitter with the sweet, pr-wise. @Alan Gunn: "Second, before becoming president, Obama wrote and published his autobiography twice." What is this supposed to mean? Obama wrote and published one memoir, Dreams From My Father, and a second book, The Audacity of Hope, which was a book about policy, not an autobiography in any sense of the word. "The Senator has a generally warm and inviting style of communicating that portrays himself as an agent of change in American politics. In terms of writing style, THE AUDACITY OF HOPE is a good, though sometimes "preachy" read; at times, it seems a bit too earnest or striving for political correctness. Obama deserves credit for being able to discuss his values and faith in a manner that is more comfortable than many of his political contemporaries. And, in the book, he does a reasonable job of articulating why and how his faith and values cause him to think and act in the way that he does." Sounds more like a book about himself than about "policy." But, as I said, I haven't read it so I don't insist.